In the engineering job market, experience is everything. Even a good portion of entry-level jobs require one to already have experience – before they have even graduated. Where can one get this experience while they are still in school? One place is through Baja SAE. Baja SAE is an intercollegiate design competition run by the Society of Automotive Engineers (SAE). Throughout this competition, teams from throughout the United States and other nations compete in the design, marketing strategy, and dynamic prowess of their vehicles. 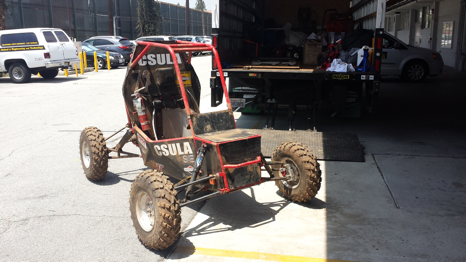 Baja SAE simulates the design, planning, and marketing challenges of introducing a new product to market. Students need to function as a team to design, build, test, promote, and race their vehicles. Prior to joining Baja SAE, I was taking courses just to fulfill requirements. I would be listening to lectures and wondering what practical use this theory had. Then I joined Baja SAE. All of a sudden, I now had something to apply my engineering theory to. In order to design and build this vehicle, I would have to use the theory I learned in the classroom. Designing parts for the vehicle also meant I had to reference material from previous classes, which effectively allowed me to review material that would have been otherwise forgotten from lack of use. 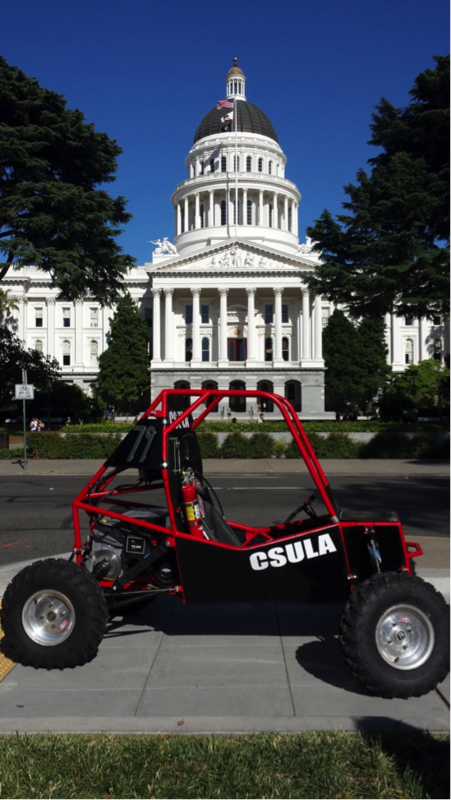 I learned and developed many skills throughout my time in Baja SAE. I started with very little knowledge about cars and almost no knowledge of hand tools. In fact, one of my first tasks while on the team was to pick up and sort nuts and bolts. While this appears to be an unskilled task, there was knowledge to be gained from it. I learned how to identify the strengths of bolts in addition to the various thread sizes and the standards that govern them. As one of the machinists on the team, I experienced firsthand the complexities between designing a part and actually making it. Competition is where it all comes together. After a year of hard work, the vehicle is now complete and it is time to see how it stacks up compared to other teams. While the presentation and initial dynamic events are fairly uneventful, the endurance race is where things heat up. With about a hundred teams on the track and four hours to complete as many laps as possible, anything can happen. Vehicles flip and crash. Parts become heavily damaged and break. A broken part, however, doesn’t mean the end of the race. Teams are allowed to fix their vehicles and send them back out onto the track. As every second counts, this is a huge test of the team’s ability to adapt to and solve a problem on the fly. All in all, Baja SAE has been a great experience for me. The wealth of real-world experience I have gained is invaluable. In today’s society, many college graduates face the Catch-22 of work experience: to get a job, you need work experience, and to get work experience, you need a job. Otherwise, a pattern has emerged in which many graduates are either unemployed or underemployed for their skillsets and degree specialization. The prospects appear bleak for further advancement in their career of interest. What if I told you, though, that there is a workaround? And what if I told you that that workaround is something you’ve known all along? According to employers, the answer is volunteering. But wait a minute. Isn’t volunteering just like working for free? Why would I want to spend my time and money volunteering when I need to find some way to put food on the table? My budget is tight enough as it is already. While the returns on volunteering may not seem obvious, volunteering can actually lead to that coveted position later down the road. A research study conducted by the Corporation for National and Community Service shows that volunteering can actually help land that dream job. The report concluded that those who volunteered were 27% more likely to get hired than those who didn’t. As cited in the study, Secretary of Labor Hilda L. Solis stated that “Volunteerism can be a way to help unemployed workers expand their network of contacts, improve their résumés, and make a positive impression in a competitive job market.” And the returns are not only financial, but studies show that volunteering is beneficial for one’s physical and mental health. Learn new skills. Volunteering is a great way to acquire new skills and gain deeper insight into an industry. With a nod to Malcolm Gladwell’s 10,000 hour rule of “deliberate practice,” volunteering gives you a headstart in working toward mastery in a certain trade. It can also introduce you to company practices, providing you with an inside look at how an organization is run and operated. Develop your network. Professionals in your target industry are powerful sources of advice and access to information on future opportunities. Volunteering presents a chance to make new contacts and interact with those who share your career interests. While volunteering, you can build relationships and expand your professional network. As an added bonus, if you perform well, your supervisor may agree to be a future reference. Practice leadership. What better chance to explore new roles and try out new activities? By taking on additional responsibility, you can exercise leadership abilities that equip you for positions that call for a greater need of skills in direction. Improve job prospects. As shown by the study referenced, employers value candidates with volunteer experience, which can be added to your resume. Better yet, if the organization likes you, then you may even snag a position there. Volunteering is the next best thing to an internship and can even supplement your personal brand. Build your personal brand. This goes with the principle above. You can add volunteer experience to your resume and LinkedIn profile to enhance your personal brand. Many employers value a spirit of volunteerism and commitment to causes. Additionally, showing that you are an active and frequent volunteer can reflect positively on your character and who you are as a person. Get a sense of the current industry environment. During the process of volunteering, you can get a better sense of the field and company culture. Volunteering can help you determine the fit between you and your target industry and whether it is one you want to enter. Make you happier. A study carried out by the London School of Economics demonstrates that volunteering can make you happier. The act of volunteering can promote personal well-being and offer a sense of meaning and fulfillment. So an extended life, better health, and happiness? Sign me up please! What’s to be gained from internships? A student researcher’s perspective. It’s been said that one of the most beneficial ways to start a career is through internships. And to be sure, the values of getting an internship are apparent. After all, internships can offer someone work experience, something valuable in any resume, as well as a chance to network with others, which can get someone’s foot in the door where they want to work. But frankly, I’ve found that those benefits, while certainly important, often overshadow another advantage of internships that is too often understated: the chance to discover whether you truly want to enter a particular field of work. Now, let’s be honest here. In today’s economy, a stable job is quite the high priority, and the luxury of finding a job that’s “right for you” might not always be feasible. But for careers that are similar in their job prospects, how do you choose the one path you want to pursue? How do you avoid picking the wrong calling and spending a lifetime in regret? One way might be to simply follow the career that seems most appealing to you—perhaps the sciences call out to you, or you feel at home with crafting articles. But as I’ve found out firsthand, the actual work done in a particular profession might be significantly different from popular perception. For instance, what do you picture when you think of a biomedical researcher in a cancer lab? Before I started my first research internship at the Kesari lab in the UCSD Moores Cancer Center, I would have imagined quite the clichéd character: somebody in a white lab coat and goggles, diligently working away on an experiment at a lab bench by themselves. Back then, I would have thought that perhaps this hypothetical scientist is simply a few steps away from gaining some valuable piece of data, or a new breakthrough. After all, if they’re working in a cancer lab, then given enough time and resources they would surely make a significant advance sooner or later. That’s why donating towards cancer research is so important, isn’t it? It wasn’t until a few weeks into the internship that I began to realize the differences between what I had imagined to be research and actual research. And while they weren’t enormous differences, they certainly changed my fundamental understanding of the field. For instance, I found that much of biomedical research isn’t actually that close to tackling the big issues, such as finding the cure for cancer—instead, it’s more devoted to uncovering the details of things such as obscure proteins or signaling pathways, whose discoveries have no obvious or immediate therapeutic implications. And I saw that even then, for every 1 of these discoveries made, 100 experiments had been carried out previously which resulted in nothing. The one thing that has no certainty in any lab is whether or not you will find the result you’re looking for. Yet, despite these discoveries, I found that research was actually something I’d be truly passionate in pursuing. After all, there’s something immensely satisfying in getting a protocol to work after days of failure, through a carefully calculated modification that you planned out. As I found out, there’s a great amount of flexibility in your day-to-day work; creativity is rewarded if it produces quality results. And frankly, I thought it was plain old awesome to be able to use the biology I learned in school to carry out experiments, such as treating a cancer cell line with certain chemicals and measuring any resultant changes in their protein expression levels. For me, the “magic” of research lies in the fact that I can make an individual contribution to our understanding of life and its related processes, no matter how small that contribution may be. My point here isn’t to convince you to consider pursuing biomedical research, or to turn you away from it—perhaps I’ll tackle that topic in a future post. Truthfully, I’m not even very concerned with informing you about what biomedical research is like, since that would be something for you to find out personally if you’re interested. Rather, I’d like you to consider a few questions, since your answers to them might affect how you go about the rest of your life. What do you know about the career you plan on pursuing? And if you are knowledgeable about the realities of a line of work, how much do you know about what it’s like to actually do the work on a daily basis? If your answer to either question is “not much,” perhaps an internship is something worth looking into.